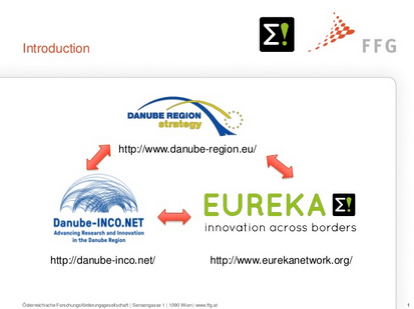 Danube-INCO.NET supported initiative: submit your projects to the EUREKA programme until June 17! The E!DI Call intends to finance industry driven research and development project in which the project partners are collaborating to realize a new, innovative product, process or service across the Danube Region. On April 30 was the "not mandatory" deadline for submitting project outlines. Provisional information on both participation of organisations and submitted project outlines was disclosed. The E!DI Call results from an initiative following the EU Strategy for the Danube Region (EUSDR), endorsed by the European Council in 2011, which aims at a closer collaboration by creating “synergies and coordination between existing policies and initiatives taking place across the Danube Region”. The call addresses consortia of at least two independent enterprises from at least two of the participating countries who want to carry out a collaborative project. The proposed project must be an industry driven research and development project in which the project partners are collaborating to realize a new, innovative product, process or service. 30.April was the "not mandatory - but a strongly recommended" deadline for submitting project outlines. Provisional data on participation and submitted outlines confirms the strong interest of the S&T community of the Danube Region towards multilateral R&I project collaboration. As of 4th of May, the following results indeed indicates great participation from Serbia and Romania in particular, followed by Hungary and Austria. Additional project outlines have anyway been submitted also in next days confirming a dynamic situation and already the success of the initiative, which is supported also by Danube-INCO.NET's workpackage on the coordination of funds. Interested project proposers are still able to submit own ideas by the 17th of June and to get in contact with their respective country EUREKA NPC for getting more details.